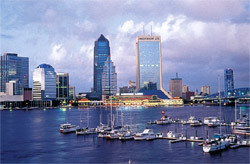 Get Jacksonville economy & local business climate, Florida economic conditions, biggest Florida employers & industries. On September 5, 2000, residents across Jacksonville turned out at the polls to approve The Better Jacksonville Plan as a blueprint for Jacksonville's future. The Better Jacksonville Plan is a $2.2 billion comprehensive growth management strategy that provides road and infrastructure improvements, environmental preservation and targeted economic development, and new and improved public facilities. The Plan is funded through a half-penny sales tax and by leveraging existing revenue sources. With $1.5 billion set aside for road and infrastructure improvements, neighborhoods in all parts of the city will see a direct benefit from the Plan. Further, targeted economic development will encourage job growth in areas that have lagged in development opportunities. The Plan includes funding to improve the environment through land preservation, enhancing neighborhood parks, and sewer infrastructure in critical areas. Finally, the Plan seeks to provide residents with quality public facilities and includes funding for improved neighborhood libraries as well as a new main library, sports and entertainment arena and baseball park, and county courthouse. The Better Jacksonville Plan marries all of these key elements into a design that will encourage and support responsible and managed growth while creating a better quality of life for all of Jacksonville's residents. An integral piece of The Better Jacksonville Plan is the accountability measure that is actually a part of the legislation. The ordinance calls for a Financial Administration Committee that includes a private citizen from the financial/business community, two additional citizens, the Managing Director of JEA and the Chief Administrative Officer of the City. The Program Administration Committee, by ordinance, consists of two private citizens, the City's Director of Public Works, the Executive Director of the Jacksonville Transportation Authority and the Managing Director of JEA. Visit www.betterjax.com or call (904) 596-1440 for more information about each project.